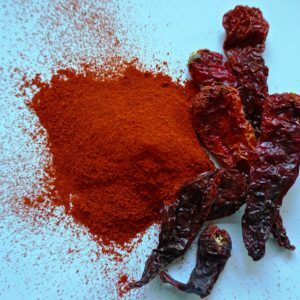 A spicy winter curry is what keeps the cold spell at bay for me. 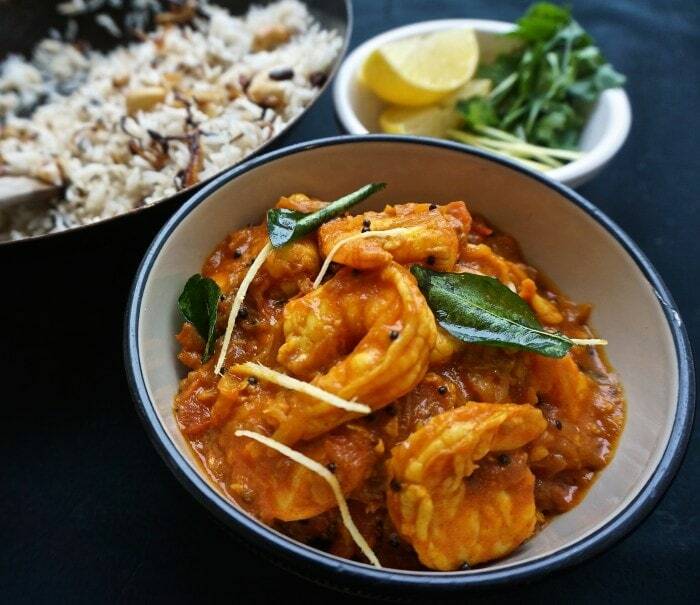 This delicious keralan prawn dish is just what I have been craving for a while. I am so lucky to have a brilliant fishmonger not far from where I live. For me quality local seafood is a must and makes for better meals. Although I’ve used king prawns for this dish, they were a generous size and enough to feed a few of us. 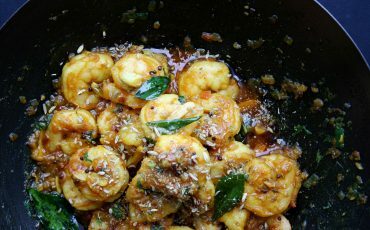 Chemeen Mulakitathu essentially is a spiced thick gravy using fish or prawns, that hails from the Keralite Muslim community residing in the north of Kerala. ‘Moplah’ cuisine is distinct for their spice and yet being utterly wholesome. The food from this community is one of my favorites during celebrations. And is a classic example of how northern keralan cooking has its unique take to the rest of the state. 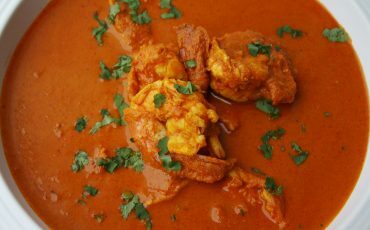 This prawn curry is spicy, sour, hot, sweet and tangy all at once. I use shallots for this dish as it is traditional and also they are milder. If you can’t get hold of shallots you can opt for red onions too as they impart a lovely sweetness when fried. As always the key to adding tamarind mentioned in my recipes is to check the strength of the paste. My paste for this recipe is quite weak so I required a little more than usual. I love ghee rice and probably could eat it every day! And this prawn dish is the perfect excuse to serve it with. Heat the oil in a heavy bottom saucepan on a medium heat. Add the mustard seeds and let them splutter. Now add the fenugreek seeds and the sliced shallots. 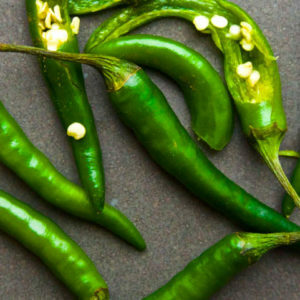 Fry for a minute and add the green chilli along with half the curry leaves. Continue to fry for 8-10 minutes over a medium heat until the shallots begin to change colour to a light brown. Add the garlic paste and stir for 30 seconds. Add the powdered spices and fry for a further 10 seconds making sure it doesn’t burn. Add the tomatoes and continue to cook until they soften for 6 minutes. Mash with the back of the spoon and add water along with the tamarind paste. Season to taste. Lower the heat and bring to simmer for 2 minutes. Add the prawns and cook over a low heat for 6-7 minutes with the lid on stirring half way through. Turn the heat off and add the ginger slivers along with the remaining curry leaves and coriander. 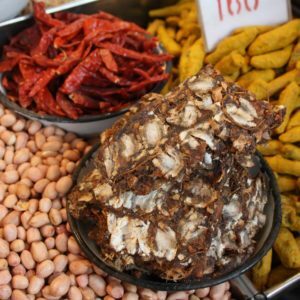 I have been hooked to your recipes and this blog since discovering it! 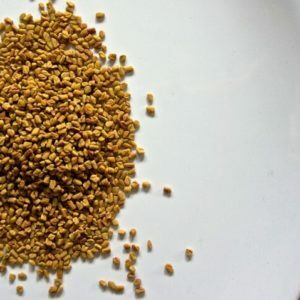 I have a question regarding the use of fenugreek seeds in — coincidentally I guess — most of your recipes I’ve tried. 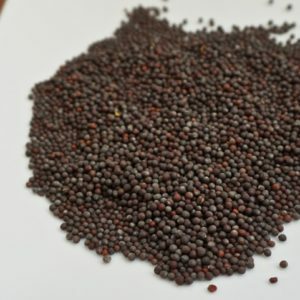 Albeit I do believe the sharp taste these seeds impart is quintessential to attaining that “pickly” burst of flavor, yet I can’t help but feel that awful bitter after taste that ensues every time I’ve used them. And its totally masks the other gorgeous flavors. I do use them sparingly and according to your guide but that bitterness still creeps up. Any ideas or tips how to nullify it? Am I doing something wrong? Thanks so much for your time. Thank you! 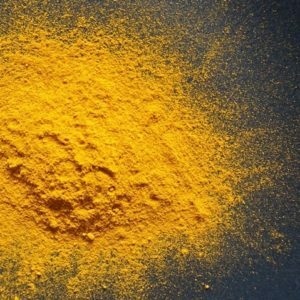 You can find information on Fenugreek in the spice pantry section as well of the site. Juts make sure you fry it only for a few seconds. So glad your enjoying the recipes! I made your prawns curry yesterday and it was absolutely delish!! I was in a rush to make it an added 4 tbsp of tamarind only to see your comments later about it. It was too sour, I sauteed 1 sliced onion in ghee and added to the curry.. worked out perfect! Had guests over and everyone LOVED IT! Hi Maunika, I’ve made this curry tonight and it is a bit watery and dark in colour. It is not looking as yours. Don’t know what did wrong. I even gave less water as looked like too much to me. Any idea? Hi Maunika. 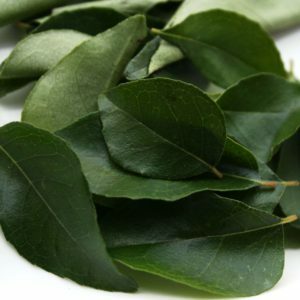 What is curry leaves called in Indian and is there a substitute for it?? I cant easily get hold of it where live. I would recommend leaving it out if you dont find them as the flavour is tricky to substitute. Hi Maunika! can i substitue baby octopus for the prawns? if so how should i incorporate the baby octopus into the dish? You want to ensure the octopus doesnt over cook so I’d suggest make the gravy first. Sprinkle the baby octopus with a pinch of paprika and pan fry separately just before serving with the curry. Hope you enjoy it! Thank you! We havent shared it yet although will do soon:) you can serve this with rice or naan too!